Ellen Jane Froman was born on 10 November 1907 in St. Louis, Missouri. Her parents Anna T. Barcafer and Elmer Ellsworth Froman were married in 1891 and separated c. 1912. Anna, of Clinton, Missouri, received her teacher's certificate from the Chicago Musical College in 1892. She taught music, played piano professionally, and sang in Chicago and later in St. Louis. During 1902 and 1903 she studied in Europe. After the separation, Anna took her daughter and returned to Clinton, moving to Columbia in 1919. There Anna taught music, first at Christian College and then at Stephens College after her second husband William J. Hetzler died in 1944. Froman graduated in 1926 from Christian College with an associate degree in French and then attended the University of Missouri School of Journalism. There she starred in the J-School revue Bagdaddies. Froman did not graduate but went to Cincinnati to study voice at the Conservatory of Music from 1928 to 1930. Before graduation Froman broke into radio singing and doing commercials. She also sang occasionally in classical concerts with the Cincinnati Symphony. In 1931 she moved to Chicago to take advantage of the greater opportunities there and was hired by NBC radio where she gradually developed an excellent radio reputation. She began to get theater offers and did guest appearances in New York City. 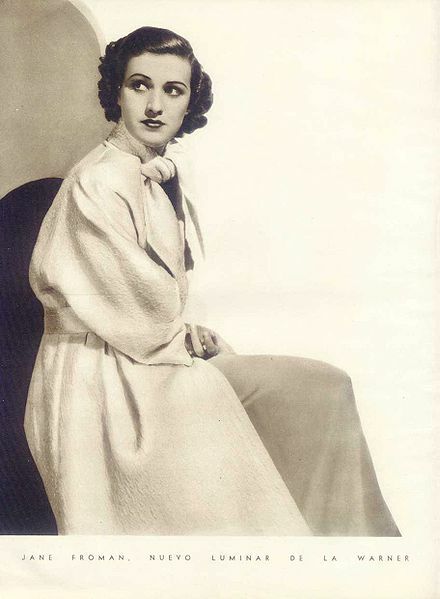 Recognizing that she would receive more exposure and opportunities in New York, Froman moved there in 1933. Her first big break came when she got a job on the Chesterfield program that also starred Bing Crosby. This led to many other offers, one of which was to sing in the 1933 Ziegfield Follies. She married Donald McKaig Ross, a fellow entertainer, in September 1933, right before going on the road with Ziegfield. In 1934 she was voted the number one girl singer on the air. Froman made her first film, Stars Over Broadway, in 1935. She then returned to New York to continue in radio and theater. Her second movie, Radio City Revels, was another musical made in 1938. In 1940 Froman started making nightclub appearances. She also starred in Keep Off the Grass on Broadway with Ray Bolger and Jimmy Durante. In May 1941 she did the first camp show for servicemen at Camp Dix, New Jersey. She also appeared in the first USO shows that month at Fort Belvoir and Fort Meade. In 1942 Froman continued to do USO shows and other forms of war work. She was also one of the first performers to volunteer to entertain troops overseas. Her professional career continued, including club dates, radio, and a Broadway production, Laugh Town Laugh, with Ed Wynn. On 22 February 1943, while on her way to Europe to do a USO tour, Froman's plane crashed in the Tagus River at Lisbon, killing 25 of the 39 people on board. She had a compound fracture of the right leg, the left leg nearly severed below the knee, two broken ribs, and the right arm fractured in several places. She was finally able to return to the United States in April 1943 and underwent several operations. Froman appeared in the Broadway show Artists and Models in November 1943. Unable to walk, she rode on and off the stage in a disguised, motorized wheel chair. In order to pay medical bills she was compelled to do club dates using a mobile, electrically-powered piano. In May 1945 she went, on crutches, to Europe with the USO to do shows for the occupation forces. During the late 1940s she underwent many more operations while continuing to appear professionally. On 12 March 1948 she married John Curtis Burn, who had helped to save her life. She had been divorced from Don Ross in February. Later that year she walked without crutches for the first time since her accident. With A Song in My Heart, a film of Froman's life story, was released by Twentieth Century Fox in 1952. It starred Susan Hayward but Froman's voice was dubbed in for the songs. After making many television guest appearances, she was given a show of her own in 1952. Originally called USA Canteen, it was later named The Jane Froman Show and ran for three seasons. More operations became necessary in the mid-1950s, this time for spinal problems. The total number of operations which Froman underwent has been estimated at 39. After these she began to make club and television appearances and continued to record, finally retiring in 1962 at the age of 55. Froman returned to Columbia and married Rowland H. Smith on 22 June 1962, having been divorced from John Burn in 1956. In Columbia she participated in Christian College alumnae activities and was active in church and civic affairs. She was also a trustee of the Menninger Foundation in Topeka, Kansas. Funds provided by her fan clubs had helped to start the Jane Froman Foundation in 1951 which helped to build a children's hospital at the Menninger Clinic. Jane Froman Smith died in Columbia on 22 April 1980.